As I mentioned in a previous post, we have devoted a lot of time writing about protecting your device under test (DUT) from the two main DUT-destroying forces available from a power supply: excessive voltage and excessive current. Click here for one of the latest posts including a list to the other posts. Today I’d like to cover another topic that can cause DUT failure due to a power supply. Some DUTs have multiple DC inputs and some of these multiple-input DUTs are sensitive to the order in which the inputs turn on or turn off. Subjecting the device to an uncontrolled sequence could cause latch-up or excessive current to flow resulting in compromised reliability or even immediate catastrophic failure of the DUT. So properly sequencing the multiple voltages at turn on and off is essential. My colleague, Ed Brorein, wrote a very similar post last year (click here) but I thought this topic was worth repeating especially since we added another series of power products with higher power that has this capability. Various methods have been used in an effort to address the potential problem associated with improperly sequenced power inputs. Diodes can be placed from one input to another to clamp the voltage thereby preventing one input voltage from going too far above or below another input voltage but this method has limited effectiveness and variable results. Relays can be put in series with each input and controlled with timing circuitry but the relays introduce variable series impedance and timing is imprecise. FETs with associated control circuitry can be placed in series with each input however this method requires significant design time and adds complexity to the setup. Multiple DC power supplies can be controlled through software, but once again, timing is imprecise and response times can be slow. Several years ago, I wrote an application note on a closely related topic (click here). The method that is most precise and introduces the fewest complications is to use a power supply system that has output sequencing integrated into the system itself. 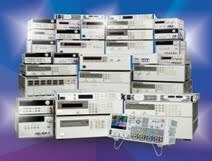 Keysight has several power supply systems that can accommodate precise output sequencing: the N6700 Modular Power System, N6705 DC Power Analyzer, and the more recently released N6900/N7900 Advance Power System. Each system offers the ability to precisely control the turn-on and turn-off sequence of multiple outputs. Timing is set with sub-millisecond resolution. Synchronization across systems is also possible to facilitate timed shut downs of larger numbers of power supply outputs for your DUT inputs. The above mentioned application note specifically addressed the topic of how to configure the system to properly shut down your DC inputs in sequence upon a fault generated by any of the system power supplies. Below is a simple example of a sequenced turn on of four outputs in an N6705B mainframe. 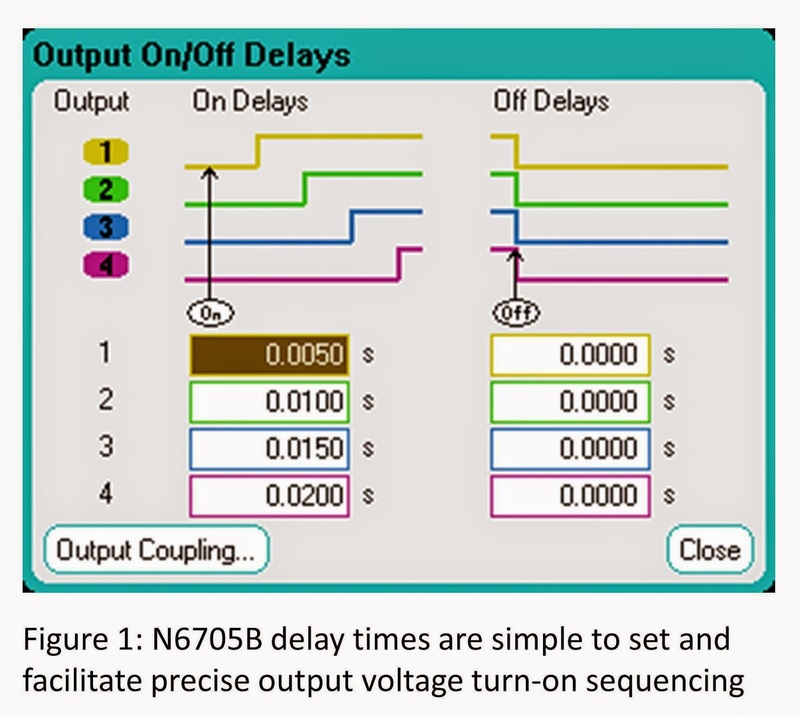 The sequencing is facilitated by setting a different turn-on delay time for each of the outputs (turn-off delays can be set independently). When all outputs are told to turn on simultaneously, the delays are activated resulting in a precisely controlled sequenced turn on. Figure 1 shows how easy it is to implement the delays for a turn-on event. In this case, I used four power supply outputs in an N6705B mainframe with delays set to 5 ms, 10 ms, 15 ms, and 20 ms. I set the output voltages to 10 V, 7.5 V, 5 V, and 3.3 V. You can also set the output voltage rise time (slew rate) independently for each output. 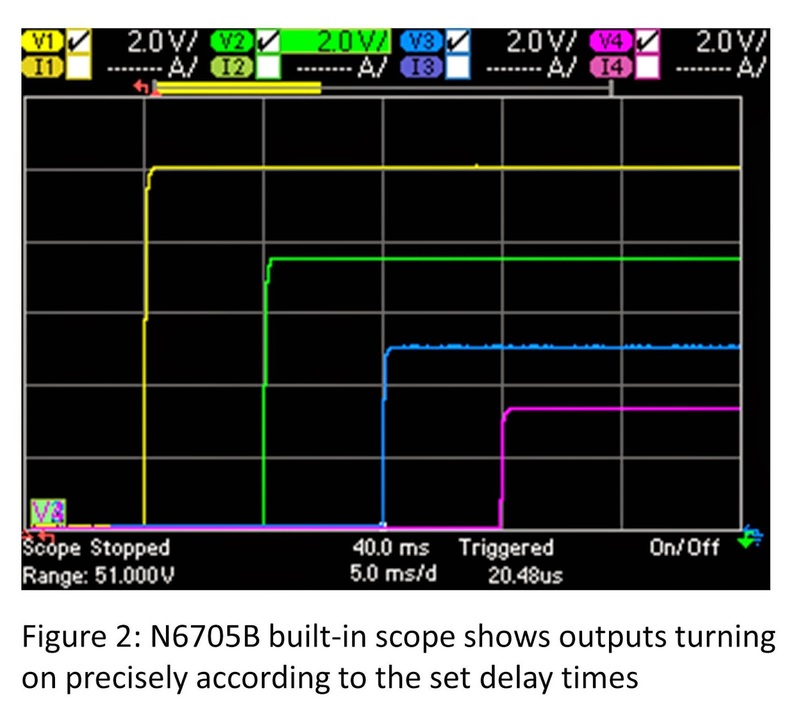 Figure 2 shows the results using the scope that is built into the N6705B mainframe. So you can see that with the proper power supply system, sequencing your multiple DC power supply inputs on your device to protect it from damage is easy. Keysight provides you with the solution to do just that adding to our arsenal of features that protect your valuable DUT.